In recent days, I had the great pleasure of attending my first CUE conference in Palm Springs. For those of you who are not familiar with CUE, it stands for "Computer Using Educators." The conference has a longstanding history in K-12 and is comprised of a strong community of educators using technology who not only truly understand the critical importance of technology to pedagogy but advocate for it with passion. I was impressed with the conference from top to bottom, especially the sense of community among the CUE presenters and attendees which I experienced on a new, layered level through Twitter's hash tag #CUE10 (check it out for yourself). As most of you know, my background is in higher education. What I notice when I attend K-12 conferences is a significant shift in the nature of presentations. Absent is the heavy theoretical research element that we see so emphasized in higher education. Is that a negative thing? In my opinion, it's not. What we had in place were many outstanding, practical presentations demonstrating how to apply tools (many open source or web 2.0) directly into instructional practice. I believe that educators today, if they're teaching in K-12 or at the college level, need more help with the pedagogical application of technology at a conference experience (with live Q&A from experienced presenters) than they need exposure to theoretical research, which can be achieved through reading journal articles throughout the year. But that's just my opinion. What do you think? I was quite amazed at what I learned and have come away from the conference excited, motivated and longing to be teaching again -- I see relevant applications of these tools for face-to-face and online learning, by the way. For example, I had used Google Earth in my classroom before to create a visual context for the far away places and things we were learning about. For example, when shifting from a unit about the art of Ancient Mesopotamia to Ancient Egypt, I would pull up Google Earth and "fly" the class from Iraq to Cairo, and zoom in on the Pyramids of Giza and other monuments. This would facilitate a connection between the ancient world of treasures and relics and our own contemporary surroundings -- and often lead to compelling discussions about war and politics and their impact on these monuments and objects. But I was not aware of the rich interactive experiences that many educators are utilizing Google Earth for...wow! Ken Shelton lead a dynamic workshop that was supplemented with a Google Site filled with relevant links and goodies for us to dig into. He took us on a tour to the Prado Museum in Madrid, Spain. Together, we flew across the globe and zoomed into the 3-dimensional structure. He clicked on it to reveal a collection of thumbnail images representation a series of images from the Prado's rich permanent collection of paintings. 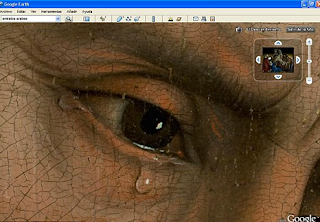 He then clicked on a thumbnail of Rogier van der Weyden's "Descent From the Cross," 1435-38. 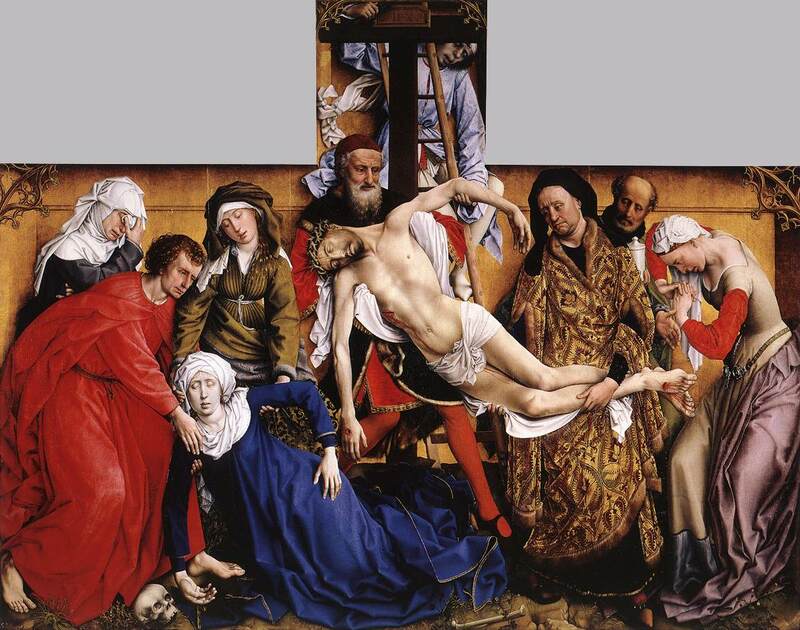 Then he clicked on the image again and zoomed in closer, closer, closer, closer to the face of Mary (figure in the back row, far left) who is collapsing in grief at the sight of her dead child, Christ, on the cross. Her eyes reveal tears reflecting light, as if the canvas were there, right in front of us. All I could think about were the art historians who are still teaching with color slides and how most who have transitioned to teaching with digital images are prisoners of PowerPoint. The technologies utilized most in teaching art history contain our pedagogy to linear presentations of images. We are often afraid of taking risks because the technology won't work or we aren't interested in learning something new. But these are tours that our students could embark upon themselves. This presentation made me ache to be back in front of a classroom of students. The next portion of the Google earth workshop went on to explore an activity known as Google Lit Trips, which was completely new to me! I imagined myself as a student in school throughout this portion of the presentation. As a student, I struggled with reading -- really struggled. At first, I was skeptical that Google Earth could facilitate a learning connection for literature but, gosh, was I wrong! A "Lit Trip,"is a visual journey that traces the geographical landscape of a book's story. The quintessential source for Lit Trips, from the workshop's dialogue, is the blog Google Lit Trips which provides visual examples of the lit trips available for you to download and share with your students. 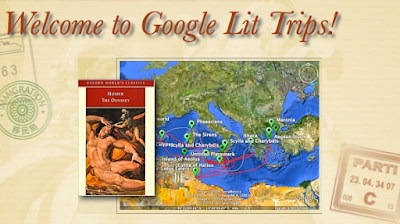 Here is a screenshot from Google Lit Trips illustrating the visual journey of Homer's Odyssey. I see how this would help me learn! Check out Google Lit Trips if you want to learn more, I'm clearly not an expert on this topic but the blog is an incredible wealth of resources. You are invited to download Google Earth files that you can simply drag and drop into the Google Earth application and the interactive footprint of the book's journey appears before your eyes. Take this one more step and students can then add a layer of their own thoughts into Google Earth through writing, embedding images from their own visit to a location, sharing an audio comment as they role play the character...the learning opportunities are endless. I am imagining an art history student documenting a diary, playing the role of a time traveler from prehistoric through the medieval period (or renaissance through modern ... any period would work), stopping at the monuments that are most amazing to her/him and writing about the objects in relation to their historical context and infusing her/his personal thoughts and questions along the way. The end result would be shared with the class through Google Earth file (sent just like a Word file) in a wiki or Google Site. Oh...how marvelous learning is today! I learned a great deal at this conference and have much more to share...stay tuned! Wow Michelle, this is super exciting! I'm not that familiar with Google Earth unfortunately. A couple of professors have used it in class, but I have never explored its "amazingness." However, after reading this post, I think I just might have to check it out. By the way, the Google Lit Trip sounds so fascinating! Your example of Homer's Odyssey was brilliant--if only I had that tool when I read it! Definitely another application to have fun with! World traveling aside only briefly, I loved your analysis of CUE and what integrating technology into the classroom means for those absorbing and transmitting the information. You couldn't be more right. I remember the first time technology (mainly powerpoint) was used in one of my high school classes, I thought it was the most amazing thing. Having these tools available to assist in communicating a point or history or art is really what makes learning (whether in higher education or the path along the way) so incredible. It's addicting. I can't think of a more profound way to interact with students than that. Engaging with them in a landscape they understand and use every day is what is truly transforming learning in any level. Great stuff! Perhaps I'm way off and misunderstood everything you wrote. If that's the case, I owe you a huge apology. Chelsea, thanks for your empassioned comments. You have no idea how much I love getting comments, let alone from students! It's important for educators to listen to your thoughts and absorb your passion as we move forward with cultivating dynamic teaching and learning experiences in this global, digital world of ours. I can't take credit for the Google Earth stuff though - I'm merely sharing the great stuff other folks are doing so applaud them, not me! Hopefully it will spread. Tell your instructors. Wink, wink. I think you're right on point with your comments about theory versus application: theory is important (and I love it), but at some point what matters is what we actually do. There's a tendency to think about theory and applications as separate. That's logical, coming from a scientific background: we need to be able to test the theories and prove or disprove them. But it doesn't seem to be very interesting to learners. We add value to those theories when we help people see how they apply. In your example of Google's Prado project, there's room for quite a lot of dedicated instruction about a number of topics--art history, architecture, historic preservation, Spanish culture, etc.--but it's included in a whole package that keeps it interesting. Their introduction does a great job of making me want to know more. I haven't yet attended CUE, although I hope to go some day. But I wonder whether those workshops are effective precisely because they blend theory and application. I would imagine that most of the presenters have fairly impressive educational chops--but they're choosing to talk about education using new technology. A workshop that merely demonstrates the capabilities of Google Earth might be interesting, but if you combine it with a problem--visualizing ancient Rome--and a solution, it becomes truly dynamic. Then there's the question of whether the explosion of new educational technology is actually changing the way people learn. I think it might be. Your post set me thinking all last night, and I've returned to it twice today. I've put down some thoughts in my own blog, and I'd welcome any comments you had. I'm new to the formal study of teaching and instructional design, and I'm learning so much! Thanks for sharing your wisdom; I'll be back to learn more. I'm glad to see my blog post has triggered some further thoughts for you. From your own blog post, it looks like you're off and running. You suggested the question of whether "the explosion of educational technology is changing the way people learn?" There's solid evidence that our students are learning differently, that's for sure. This post reflects on a provocative report shared by the MacArthur Foundation about the critical importance of participatory learning to the future of educational institutions. I believe learning has already changed and we (educators) now need to figure out how to catch up to it. What a wonderful resource! Thanks for building such an inspiring Blog ... I'll be adding you to my Google Reader! how to start this... Maybe by situating myself as an ICT-coordinator in the Dutch speaking part of Belgium called Flanders. (So 'scuse my English, I'm nowhere near a native speaker *g*). You know Flanders, no doubt, as in Rubens, Pieter Breughel.. *lol* Anyways, my job is to train teachers in the field of the sensible use of technology in their classes. Which is hard, for a lot of reasons. ICT-integration in regular lessons has only been an official part of the curriculum in K-12 since 2007 in Flanders, so I see my public as toddlers, taking first steps, but without the tenacity or enthusiasm you see in little children. The thing that triggered me into commenting on this article was your observation: "I believe that educators today, if they're teaching in K-12 or at the college level, need more help with the pedagogical application of technology at a conference experience (with live Q&A from experienced presenters) than they need exposure to theoretical research, which can be achieved through reading journal articles throughout the year. " But I don't know how I feel about your 'theory' remark. I work as an ICT-technology 'specialist' in 8 schools, most K-12, but I have art academies too. Thing is, I wish I would find teachers willing to go look for and read articles about 'new learning' or 'new learning tools' or 'new tools for new learning' or even a bloody technical instruction leaflet on installing software, any software for that matter. Hmm... sorry about that. Reading your blog, and watching your presentation on voicethread f.i. (about your using voicethread in your higher ed art classes), I can't help but nod in appreciation and approval *lol*. I hear myself thinking: see? This is what it is all about. This is a living successtory of a person who is willing and open and obviously very able to experiment and just... go out there and find the tools one may need to further enhance teaching effectiveness, results, methods. To evolve in teaching, I guess. To me that is so logical, so natural that it is refreshing to see that in you too on the one hand, but on the other hand it leaves me in a state of sheer incomprehension when I look around me in my daily work. This image comes to mind, when I read your article. There's a huge white cloud drifting in the sky, high above the ground, and it carries a lot of like minded (cloud connected *g*) people over this vast grey area, populated with people who couldn't care less that clouds even exist. Now as I write this, I sense that that may sound way more pessimistic than I actually feel about the issue of introducing ICT-tools in educational situations, but the image stands. In my opinion, teachers have an acute need of theory first when it comes to introducing new things. An example of good practice or an enthousiastic demonstration goes a little way (the effect tends to wear of fast), but we're talking CHANGE here. Theory can give us the 'why' in needing to change, hence hopefully some motivation for making a start. This example of good practice AFTER theory on the issue has more than double impact. No? I can imagine this comment comes across as the ramblings of a mad man at this point, sorry about that. I'm by no means trying to temper your refreshing enthousiasm on usage of the new media, to put it in general terms. Maybe it's just the contrast between your enthusiasm and the dull gaze in some of my colleagues eyes that drove me to this. Anyways, thank you for your enthusiasm and willingness to spread it around. I'm not sure how to justify my delay to your comment. I have thought about it many times and find myself, just today, making/finding the time to write back. It was a tremendously rewarding feeling to know that I have a reader across the world who has been touched by my blog and I want to start with letting you know that. You know, blogging (at least for me) is writing "from the heart." It's an odd feeling to have my candid phrases received and understood, perhaps, differently than I had intended them. I love this experience, however, as it puts me in a different role as a blogger and challenges me to think more about different "readings" of my ideas as I share them. It seems, maybe, that I shouldn't have used the word "theory" in my post, as I do fully agree with you that all valid technological applications to learning do need to be woven into a theoretical context. In fact, as I think more about this, maybe it's the theory that should be *stronger. * So what did I mean?? I say that I too get encouraged and enthused when I see educators applying new uses of technology in creative ways and identifying their success through the feedback and learning achievements of their students. I believe we need to encourage more of this and build a cultural fabric that inspires risk-taking and experimentation in learning. But, instead, what I have observed is more of a culture based on the repetition of ideas that have already been published. That's what I was trying to convey in my post, which I admittedly wrote quickly and probably didn't select the correct words to convey what I was "feeling" at the time. Finally, your cloud image has really resonated with me. And I do see, from the perspectives of others who aren't "in the cloud," how hard change is and how much we need a variety of approaches to encourage other educators to, first, look up and see the cloud and, second, come on up and play and experiment with it. Your points are well taken and I appreciate the time you took to share them with me. Hopefully, together we can energize the "dull gaze" you observe in your colleagues. I must admit, I gave up on it after several weks *g*. Anyway,it's kind of you, taking the time. I can't imagine being the only 'follower' of your blog on this side of the ocean, but I'll spread the word.